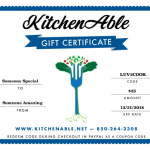 The perfect gift for any occasion this KitchenAble Gift Certificate can be redeemed toward the purchase price of any cooking classes. Please use within 12 months of purchase date. 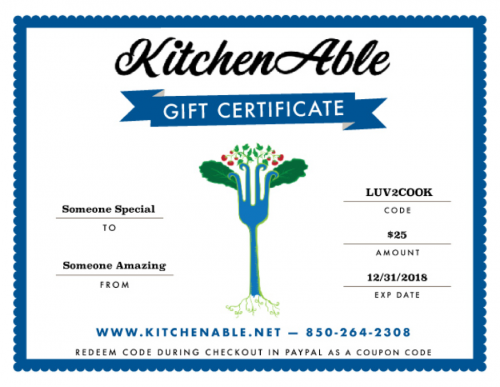 When completing the order in the comment section please specify who certificate is “to” and “from” and we will email you a printable PDF certificate within two business days. 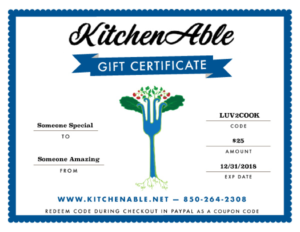 The certificate will have a code that can be entered by the recipient through our website to book a future reservation at KitchenAble. Paypal will email you a receipt of your order as soon as it goes through, if you do not receive this please check your spam folder.